KUCHING: Federal Agriculture Minister Datuk Salahuddin Ayub yesterday gave his assurance that all efforts are being done to secure the release of our fishing boats including those from Sarawak that have been detained by Indonesian authorities for the past few months, confirmed Kuching Member of Parliament Dr Kevin Yii. 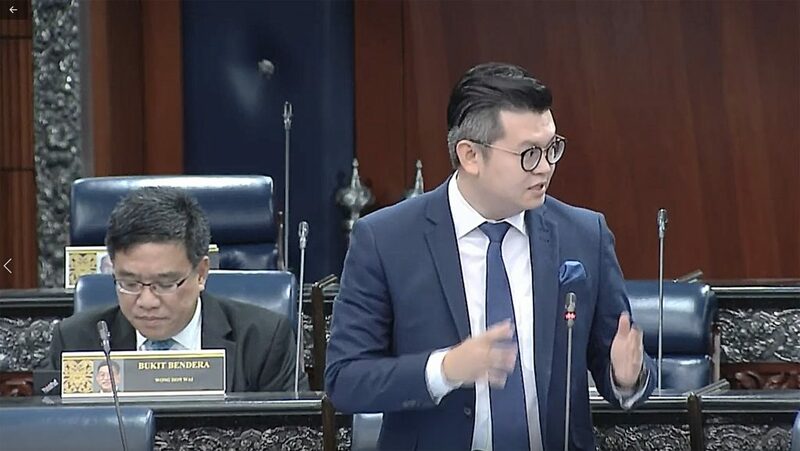 Dr Yii raises a question during question time in Parliament yesterday. In a press statement, Dr Yii said the minister had contacted the Indonesian Maritime Affairs and Fisheries Minister, Susi Pudjiastuti, for an official meeting in Jakarta to negotiate the release of the boats and also to settle the official stand on the waters disputed by the two countries. He asked the minister concerned during question time in Parliament yesterday regarding the increasing cases of Malaysian fishing boats being caught and confiscated by Indonesian authorities including two recent cases of a tourist fishing boat called Nemo and another fishing boat registered as SF1_66 from Sarawak that were intercepted last March 12 and March 13 respectively. Dr Yii said both the boats were accused of having encroached into Indonesian waters even though the coordinates provided by both boats at the point of arrest were said to be within Malaysian waters. He remembered that actually the Malaysian and Indonesian government have signed a Memorandum of Understanding (MoU) on November 2017 in Kuching. This MoU states that any fisherman caught will be released swiftly as in the majority of such offences were unintentional due to the confusion over the maritime borders. Both countries have agreed that most of the offending fishermen were not well-to-do and fully rely on fishing to earn their living. Hence they should not be treated too harshly and should be released swiftly including their boats and fishing equipment. However, even with that understanding, there has been an increase in the interception of Malaysian fishing boats by the Indonesian authorities even when the fishermen claimed that they were well within the Malaysian maritime waters. Currently, eight Malaysian boats have been confiscated by the Indonesian authorities while nine Indonesian ones are currently held by Malaysian authorities. Dr Yii hoped that the issue can be resolved as soon as possible and that the Malaysian fishermen as well as their boats be brought home. Minister assures MP of boats’ release 0 out of 5 based on 0 ratings. 0 user reviews.